Red Hook is out there; yes, on the map it looks like it’s not. 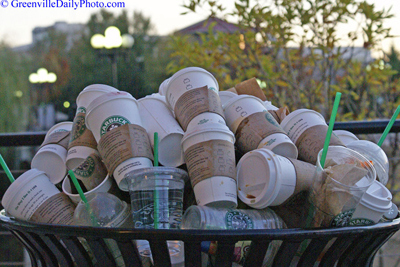 Like, before I came here I was like “??? 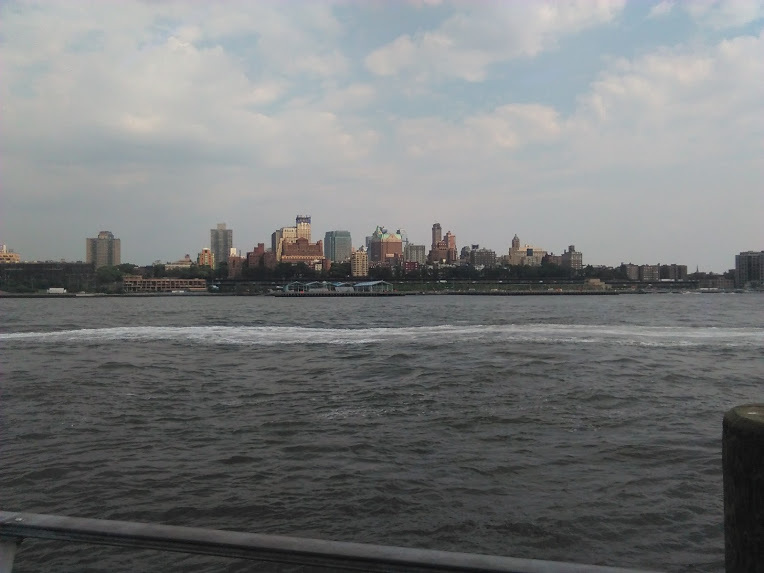 ?” – this place is right next to Manhattan! I envisioned myself canoeing to Wall Street easily – it’s only a centimeter or so on the map. Of course, biking is ideal, but not everyone has a bike! This isn’t Amsterdam (yet). I can say with confidence that Citi Bike is coming to Red Hook, but that’s in the future and this is now. Anyway, I digress. The point here is that while Red Hook faces challenges on the subway front, it has quite a useful transportation option that is not nearly at its max capacity, and that most neighborhoods throughout the city don’t have: water (and a lot of it). 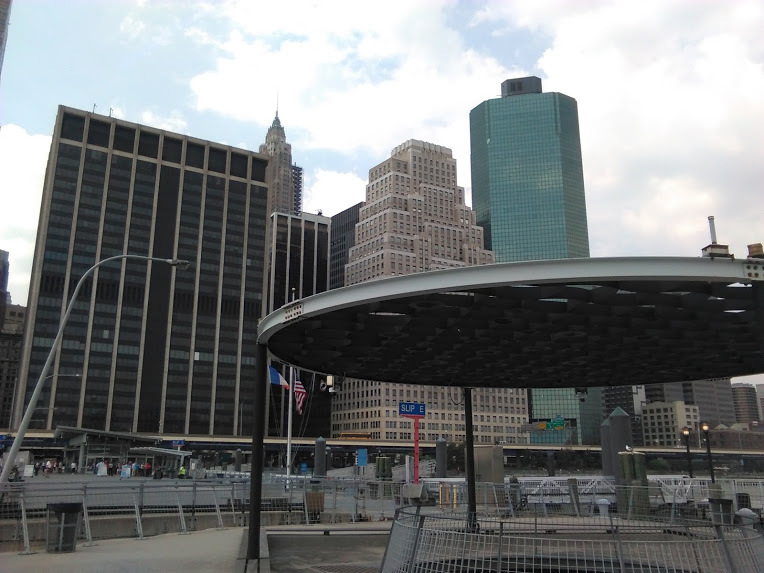 Enter the New York Water Taxi, a genius invention that links Manhattan with Red Hook in under 20 minutes, and in boats that are painted like taxis. Beep beep! This below is the taxi at the Red Hook dock at Fairway Market. 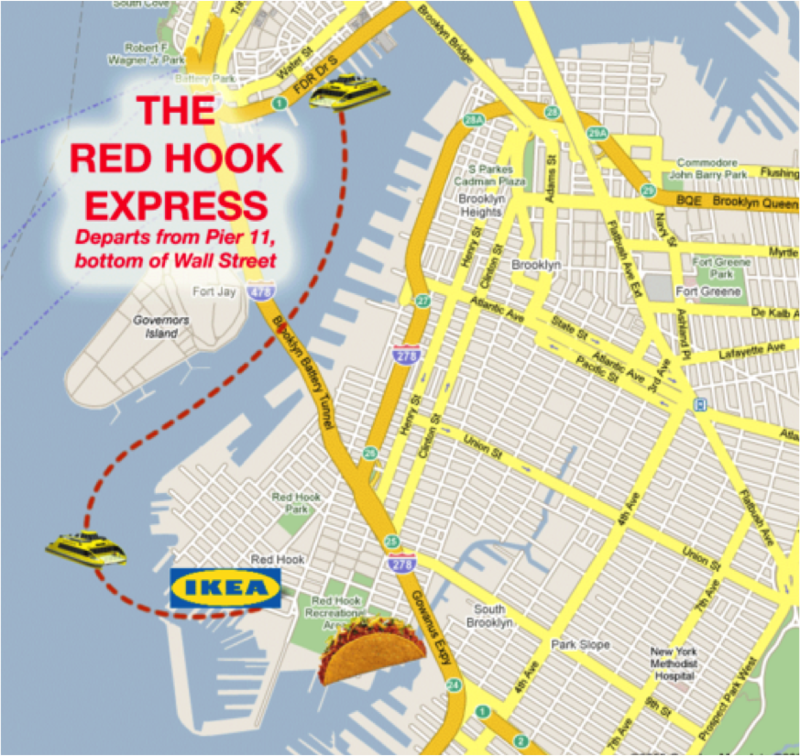 There are a few options for the taxi, but the easiest and cheapest one (for a Red Hook traveler) is the IKEA express: it’s $5 M-F, free on the weekends, and departs from Pier 11/Wall St every 40 minutes, stopping in two Red Hook locations: Fairway Market and IKEA. 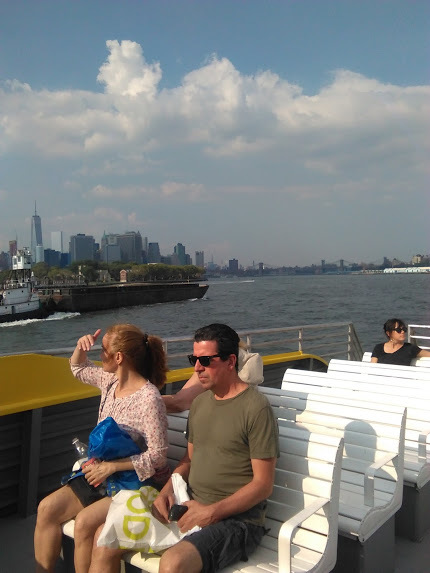 During the week, if you spend over $10 at IKEA and you traveled via water taxi, you’ll receive a $5 credit on your purchase. So, kind of free if you find yourself in IKEA (where you will inevitably spend over $10)! See below for the map (this image is taken from Serious Eats. The taco represents the Red Hook Food Vendors at Red Hook Park). 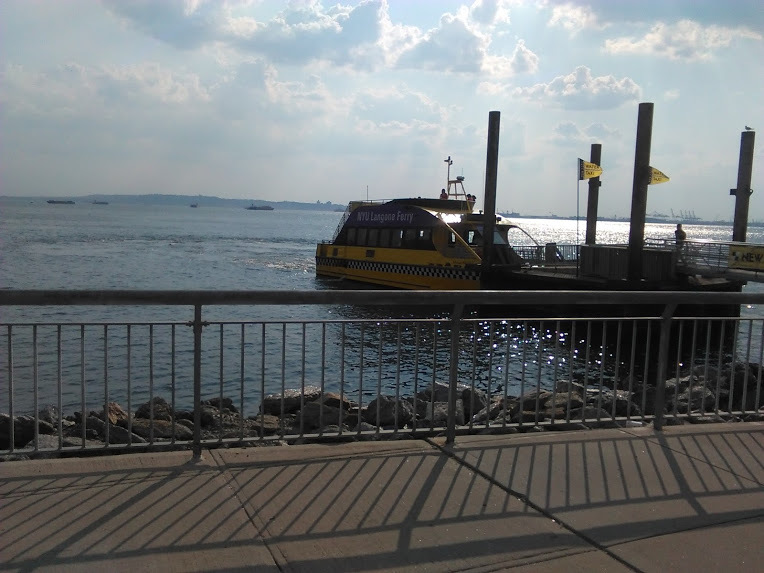 The NY Water Taxi is quick and straightforward, with great views of Manhattan, Brooklyn, and Governors Island. You can sit on top of the boat in the open air or you can sit inside the boat itself. The taxis welcome children, strollers, and bikes. Children under 5 ride for free. 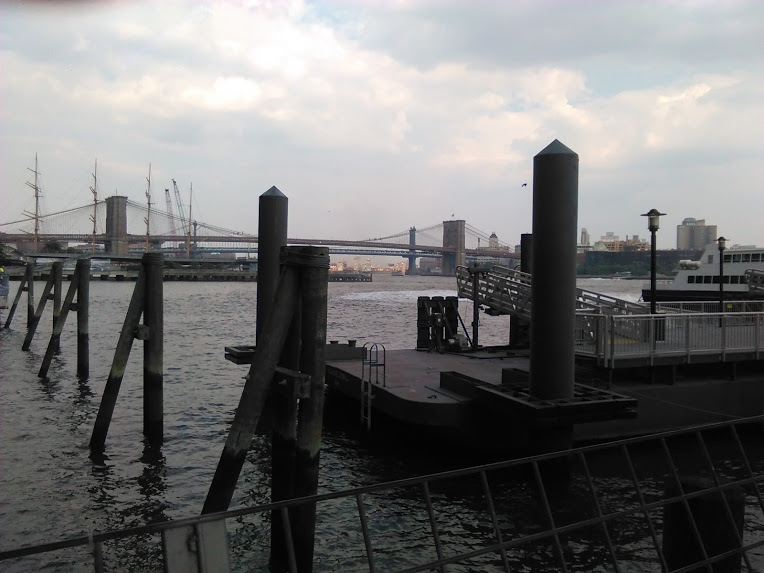 Pier 11 itself is awesome – there’s a view of Brooklyn and the Brooklyn Bridge and a feeling of maritime hardiness. 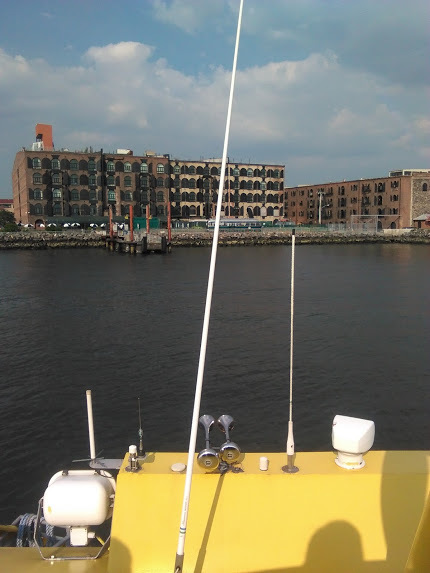 The NY Water Taxi’s home is right in Red Hook, at the Beard and Robinson Stores – a tenant of our friends the O’Connell Organization! I’m sold, but you’ll have to try for yourself. Of course, don’t come to Red Hook without saying hey to me. To read more about the IKEA Express and its schedule, click here.